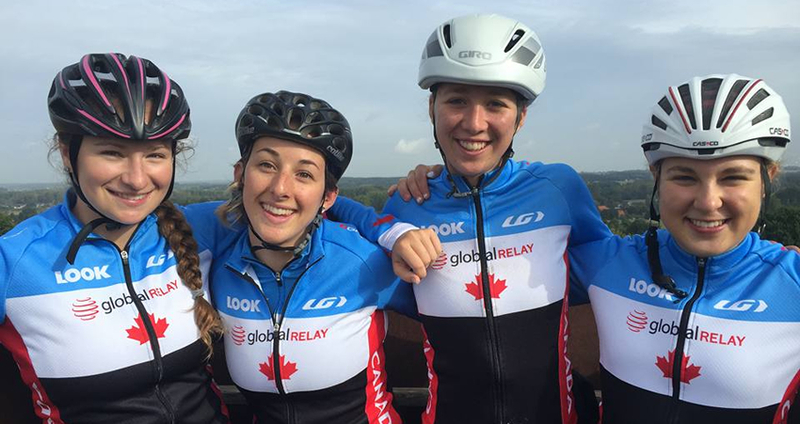 When Maggie Coles-Lyster lines up in Qatar for the UCI Road World Championships next week it will be her third World Championships of 2016 and continue a dream season for the 17 year old Canadian. Coles-Lyster's season started back in January where she competed in the first ever women's under 23 race at the Cyclo-cross World Championships in Belgium. Despite being just 16 at the time she finished the race in 41st position, just under 10 minutes behind winner Evie Richards. From there it was on to the track and claiming six junior national titles across sprint and endurance events earning her selection for the Junior Track World Championships in July, in Switzerland. After narrowly missing a medal in the team pursuit Coles-Lyster showed her all round strength to claim bronze in a hard fought omnium as a first year junior. A strong showing on the road in 2016 including claiming the junior criterium national title, selection for the Road World Championships gives the rising Canadian star a third opportunity to chase a rainbow jersey in 2016. Having spent the past two weeks in Belgium, gaining experience racing in a big bunch in a mix of junior and elite kermesses, Coles-Lyster is ready to again take on the best in the world. Despite the challenges of heat and crosswinds she is determined to make it the best race she has ever had. I first started racing when I was about eight years old, but only the novice Cyclo-cross races or youth road races. It was thanks to my dad and coach, Barry Lyster that I started racing because he owned a bike store called Local Ride and managed a race team. When I was 11, I got my first taste of track riding, and from then on was addicted to racing! Raced the U23 Cyclo-cross World Championships in January as a junior what was the experience like? It was such an incredible experience! It was my first taste of European/International racing, and being able to race with the Pro Women at the Hoogerheide World Cup, then the U23's at the World Championships, exposed me to such an elite, aggressive level of racing that I had never experienced back home. Not to mention how cool it was to race in front of crowds of almost 50,000 spectators! Dominated the Canadian Junior Track Nationals in April winning gold in the team sprint, individual pursuit, points race, sprint, scratch race and keirin. What did it mean to win six national titles? It meant that I had a shot at going to Junior Track Worlds as a first year junior and hopefully race the omnium, which was a big goal of mine. It also showed how well rounded of an athlete I am, and how, at least at the national level, it's totally possible to race and excel as a sprinter and an endurance athlete because so often you need both sets of skills to succeed in any kind of race! Before heading to Junior Track Worlds you raced your Road Nationals where you won the criterium and finished top 10 in the road race and time trial how do you find switching between disciplines? I find, in some ways, they complement each other very well. However, going into Road Nationals with Track Worlds so soon afterwards, meant sacrificing a bit of endurance training to focus on speed work and jumps, which worked out well in the criterium but made my road race a little less than what I wanted. Racing more than one discipline keeps the season definitely interesting, but it also becomes a puzzle on how and when to train for what. Mentally, I find I perform better the more racing I do, and the track training obviously paid off in the criterium and vice versa! I always convince myself going into a race that I will win, and that is what I did every night before I raced. However, I wasn't really sure what to expect or how I would do against the juniors from around the world. I was nervous about the timed events, because very fast times had been set the week before at the European Championships, so my goal was to set personal bests and Canadian records and hopefully that would mean I would stay in the contention for a medal. I love bunch racing and knew that those would be my best events, based on my past experience racing with elites and other juniors. Started Junior Worlds finishing fourth in the team pursuit disappointing to miss a medal but at the same time must have given you confidence for the omnium? It definitely gave me some confidence! We had goals going into the race, and times we wanted to achieve but we also knew that the junior women's team pursuit record has been set the week before at the European Championships. We rode our first ride flawlessly, got a perfect time and qualified fourth! Our times kept getting better in the next few races, but France kept getting stronger too, and in the finals they bumped us out of a podium spot. I am still so proud of how our team raced, considering we had had minimal training together and that that was the first Canadian junior women's team pursuit team to race at Worlds in quite a while. Difficult start in the scratch race crashing in the final sprint and sliding across the line for fifth not the start you were hoping for? It wasn't an ideal way to start off Worlds, although looking on the positive side, it was pretty cool that my bike and I still made it across the line to secure fifth place! I wasn't too badly injured, so if anything it fuelled my fire even more for the other races. Set a new personal best of 2:26.332 in the IP, a time that normally would see you near top of the standings but a strong field and quick track gave you the seventh fastest time were you happy with your ride? I was really happy that I had set a personal best by almost two seconds, and a new Canadian record, however I am never happy not winning. Based off of the times from the previous year, I thought my goal of that time would get me at least a top five, but there were some speedy girls this year who destroyed that individual pursuit! Now I know what times to focus on for next year... Unless they get even faster! Won the elimination race ahead of Elisa Balsamo who was dominant across the six event must have been a real confidence boost ahead of day two? Going into the last race of day one, I was sitting fifth in the omnium. I told myself that I would only sleep soundly that night if I could finish the day in third, which meant winning the elimination. I have almost never lost an elimination race, so I was not about to lose this one. I forced myself into ideal positioning, and maintained it for the duration of the race, even riding the front for many laps in a row. Going into the final sprint with Elisa, I played it like a cat and mouse sprint, and trusted my jump to get me across the line first! It was such a surreal moment to win a race at the World Championships, and I will gladly experience that again! Seventh in the 500m TT and second in the flying lap had you in third ahead of the points race what was your plan for the race? Did you think moving up to silver or gold was still possible? I wasn't thrilled with how I placed in the TT, but standing starts have never been my strength, and are something I will work on a lot over the next year. The flying lap was probably one of my highlight races, and I totally surprised myself with the time I did! Sitting less than six points out of silver, I knew it would be a battle to move up but that it was totally achievable as long as I raced as aggressively as possible. First place was almost 20 points ahead of me, but I am always up for a challenge and did my utmost to try and get away and rein in those 20 points over the 100 laps. A very active points race with the top three going up against each other in the sprints, you had another crash and riders taking laps how did the race go for you? I knew who to watch, and who would be a threat and those same people watched me. I would try to go with breaks that went, even if they weren't a threat, just to try and get away, but the others were chasing down everything. I was feeling really good for the first two thirds of the race, but then I hooked bars and crashed. My coach and mechanic immediately ran over, and put me back up on the bike so that I could be back in the pack in time for the next sprint. It took a few laps to shake off the crash, but once I had done that and realized that someone had bumped me down to fourth in the omnium, I had nothing left to lose so rode as hard as I could to claim that bronze medal. Claimed bronze in the omnium as a first year junior overall are you happy with how you raced? I was very happy, because I performed at my best, put down personal and Canadian records and was the strongest both physically and mentally that I have ever been. Of course you always have that part of you that wants to do better than you did, but now I am the favourite for gold heading into next year, and I always race my best under pressure so victory is on my mind! What was the biggest challenge you faced at Junior Worlds and what is the most important thing you learnt? I have been selected for Junior Road Worlds, which means that I have achieved my biggest goal ever - raced three world championship events in the same year, as a first year junior! I am now at a training camp in Belgium with three of the girls from the team pursuit team, and did my first kermesse races this week. These kermesse races in preparation for Worlds are so amazing, hard and fun! I have never raced with close to 60 junior and u17 women, with attacks constantly being launched and lots of elbow bumping, and I have to say, it's quite addicting! How important do you think two weeks racing in Belgium will be for your Road World Championship preparation? The racing in Belgium leading up to Road Worlds has been such a huge learning experience, and I feel that even with just the three races I've done, they've made me a better racer. We don't get quite that level of aggressive, high paced racing in big women's fields back home, so to be able to race a race that is more similar to what we'll encounter in Qatar has been a very important part in our pre-worlds training camp. Flat course in Qatar but the heat and cross winds are big challenges what are your goals for Road Worlds? With all of those factors, the race will have many hurdles and will be a grind. I can hold my own in a sprint, whether it be from a smaller group off the front or in a bunch sprint. This is my first Junior Road World Champs, and with such a great pre-camp and how strong I am feeling right now, I am going to make it my best race ever and race for a top placing. To keep up to date with Maggie follow her on twitter @M_ColesLyster and check out her blog here.